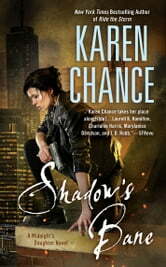 Shadow's Bane by Karen Chance is the fourth in the Midnight Daughter series. Dhampir Dory is the main protagonist. She is sassy, hilarious and I appreciated seeing this world through her eyes. Dory is on the trail to stop fae slavers while dodging assassins looking to steal her newly appointed Vampire Senate seat. There is exciting action, relationships with a depth of emotion, and Dory's quest to find mental stability. I was hooked immediately. Urban fantasies that comprise multiple casts of supernaturals tend to be more enjoyable for me. Avoiding species cliches is more likely when all the focus is not on one breed. Shadow's Bane has a variety, all unique and compelling. I haven't seen a dhampir quite like Dory. About halfway through the book, everything started to come together for me. The relationships were clear, and the depth of the threat was fully surfacing. By this point, I had a vested interest in the characters. Different backstories interject throughout the narrative, serving to help one understand the connecting plot-lines of the characters introduced in prior installments. I appreciate the context, but it became a bit tiresome for me. There was a lot to absorb, stopping midway in a scene to connect all the dots interrupted the flow. I can fill in the blanks and would rather backtrack in a series if I feel it necessary. Speaking of backtracking, I will now be doing precisely that with the Midnight's Daughter books. Shadow's Bane is what I look for in an urban fantasy series. I received an ARC copy of Shadow's Bane from Netgalley and Berkley Publishing Group for my honest opinion. I encourage all readers to come to their own conclusions. Truly sublime. I read an awful lot and there are few authors that have the ability to match such strongly vibrant characters with a riveting plot. Every time I get chance to read another one of Karen Chance’s books I am always treated to this rare combination. This book did not disappoint, and I can hardly wait for another one of her masterpieces. It was great to see how the main character is still developing and coming into her gifts. Both halves becoming more. Loved every minute of this rip-roaring ride of a book! With typical audacious Dory style and humour, we’re back in Chance’s world of vampires and fae. In this instalment, we follow Dory on her first job with the Senate searching for smugglers looking to benefit from the upcoming war. As with all of Chance’s books, this is full of action and so fast paced you will be on the edge of your seat!… if it’s possible to be on the edge of your seat reading a book… The book is quite a bit longer than previous instalments but with such a long gap between publications, the extra bit of recapping at the beginning was greatly appreciated but does slow progression of the plot for the first 100 or so pages. Once that’s out of the way we’re treated to the most entertaining book in the series that also does a lot to expand the universe of both the Dorina series and the Cassandra Palmer series. I absolutely loved the glimpses into Mircea’s past as a young vampire and the growing dynamic between Dory and her alter ego vampire self Dorina. There’s a lot going on there I never suspected and I can’t wait to see where it goes. We get a lot of growth in relationships and in who the characters are in this one as well especially with Dorina, Mircea and Caedmon. Loved every minute of this one and can’t wait for the next. Dragon’s Claw, a Dorina/Pritkin crossover novella is due out the end of this month. Not Karen Chances best - found it very convoluted at times and felt it dragged in parts. I started to lose interest in the middle of the story and at times struggled to get back in to it. In saying that I was never not going to finish it either. Dorina may have run her race.